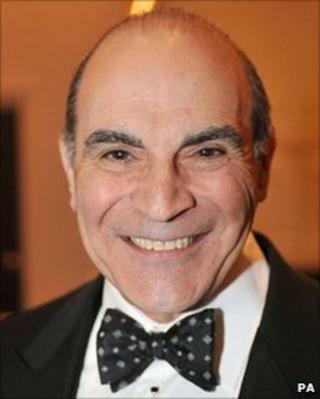 The actor David Suchet, appointed a CBE for services to drama, has played a wide variety of roles on stage and screen during a career spanning more than 40 years. The 64-year-old is best known for playing Agatha Christie's debonair detective Hercule Poirot in the long-running ITV series. He was seen on Christmas Day playing the Belgian sleuth in a new version of Murder on the Orient Express. Earlier this year he appeared in the West End in Arthur Miller's play All My Sons. Speaking in December, he told the BBC his role in the drama had been "the highlight of my 41 years as an actor". Suchet, the brother of broadcaster John, has been nominated for Olivier and Tony awards for his stage work. Among the characters he has brought to life include Cardinal Wolsey, media mogul Robert Maxwell and Antonio Salieri in Peter Shaffer's Amadeus. Yet it is for his portrayal of Poirot that the London-born actor is most recognised. He has portrayed the character in some 65 Poirot stories, the first of which - The Adventure of the Clapham Cook - was screened in January 1989. Born in London in 1946, Suchet joined the National Youth Theatre before training at the London Academy of Music and Dramatic Art. A long spell with the Royal Shakespeare Company followed, during which he played Caliban in The Tempest, Shylock and the Fool in King Lear. In the 1980s he enjoyed TV success, playing the title roles in such series as Oppenheimer, Freud and Blott On The Landscape. He has also appeared in such films as The Missionary, A Perfect Murder and the action film Executive Decision. Suchet won the Variety Club award for best actor in 1994 after appearing in David Mamet's Oleanna at the Royal Court theatre. That accolade was followed by a Critics Circle award for his role in Edward Albee's play Who's Afraid of Virginia Woolf. He won a Royal Television Society award in 2002 for his performance as Augustus Melmotte in BBC drama The Way We Live Now. He was made an OBE in the Queen's 2002 Birthday Honours list. "I don't really want people to see me," Suchet told the Jewish Chronicle earlier this year. "I'm not into stardom." The actor has two children with actress wife Sheila Ferris, whom he met while performing in Coventry.